Born in Northwich but growing up in Rochdale, he left school at 14 to work as a coach painter and sign writer. After serving in the RAF in WWII he pursued his artistic interestsAt classes and studio sessions in his free time, developing a strong reputation in the Manchester 50s art scene, before moving to St.Ives where he encountered the energy and influence of the St.Ives ‘school’ whilst painting in his own signature style. 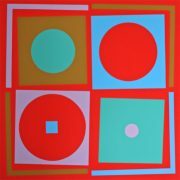 Mid-60s he moved to London and started printmaking, in a quite different style to his painting – graphic,coolly designed in glowing superimposed colour, influenced by the op-art, pop art and colourful vibrancy of 60s London.